Our democracy, our society, and our safety all require communications networks that are available and open. Any interruption of wireless services raises serious legal and policy issues, and must meet a very high bar. The FCC, as the agency with oversight of our communications networks, is committed to preserving their availability and openness, and to harnessing communications technologies to protect the public. Currently, cell phone jamming technology is illegal according to the Communications Act of 1934, but in the BART incident, service was interrupted by disabling power to the nodes, therefore making their actions technically legal, although questionable in many people’s minds. The FCC wants to know whether, and what kind, of additional legislation needs to be put into place in reference to this type of service interruption. It also wants to know when wireless service should be allowed to be interrupted, if it’s possible to allow 911 calls through even though an interruption is taking place, what other public safety concerns can arise, and who should be authorized to make such decisions. Comments can be sent to the FCC via its website at http://apps.fcc.gov/ecfs until April 30, 2012. After than, the public has until May 30, 2012 to respond to the submissions before the FCC reviews all the entries and make a decision of if, and what type, of additional legislation is needed. For additional information, see the FCC’s public notice in the source link. Forget about discussion,It's never okay to block in the first place!!! My opinion on where wireless service should be blocked: libraries, movie theaters, worshiping places, classrooms and god forbid: moving vehicles. I gotta disagree. There could be any kind of emergency that could happen, and if you happen to be alone when it does...your cell phone would be the only lifeline you have. Even in a moving vehicle. Think worst circumstances and you'll see what I mean. there are scramblers that still allow phones to dial out to 911. Sometimes the emergency is outside the theater. Imagine a mom enjoying a movie while her child is being rushed to the hospital for any number of reasons. Can you imagine how pissed she's gonna be two and a half hours later when she gets that voicemail. This is very much a first amendment circumstance. If we had a case over whether we should protect someone's rights to preach God's will on a street corner and how ***s will burn in hell (I don't condone this), I would assume that majority would all agree and say, "yeah that's ridiculous ... no more of that." The same would probably then happen pertaining to like events that have to do with abortion, politics etc; slowly restricting our first amendment. By looking at it all together, "should you be allowed and discuss religion, abortion, drug legalization, and politics openly in public" people realize their personal liberties tie to those situations and a court case to restrict those actions is oppressing their liberties. That's why we must protect all instances of free speech and not pick and choose. It may be annoying to hear someone's phone go off in the movies, or in the middle of a funeral in a church, but what then stops the FCC from restricting your use of the cell phone at work or in the car? All cell phone usage has to be protected and not restricted. 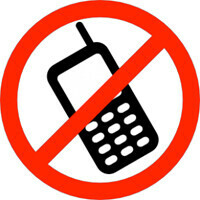 The only restrictions should be if someone's cell phone usage infringes on your personal freedoms. "The freedom to move my fist must be limited by the proximity of your chin." People are forgetting one thing: cell phones ARE NOT the only mean to make call, there are landline / paid phone booths with the same capabilities. As far as using cell phones in a moving vehicle, I see very little benefits from it. I commuted everyday to work and school and I've seen plenty of idiots out there on the highway, from soccer moms in a mini-van to an 18-wheelers truck drivers; swerving left and right like they just left the bar. If FCC can't seems to make this happen, at least they can decree the establishment owners the right to do so. yes, landlines are everywhere, most business have them, how often do you enter a business, restaurant,etc and see them talking on a cell phone to conduct business, and dont say its VOIP either! most are not yet, and personally I wouldnt want to see that, and sending faxes still needs the landline, and dont say faxing is done via the computer or whatever, look closely you will find alot of faxing still uses landlines, faxing doesnt work well with VOIP yet, and i have NO problems finding a pay phone..!! You're absolutely right. When I'm visiting my sister in Colorado and I get lost in her town, I should spend my time driving up and down the roads eyes glued to passing businesses instead of the road in hopes of finding the elusive phone booth. Better yet I should just probably pull into a neighborhood and ask someone if I can use their landline. I guess If I'm out in the country or if it's late at night I'm just out of luck. i guess that town has NO gas stations, let alone 24hr gas stations! you have pre-historic thinking! outdated thinking! only place to block is when driving a car. who wastes time in a movie theater, library or a church.. it's 2012 no use for any of those places. A little bit of everything is ok with some moderation and responsibility. Moderation and responsibility? Two things this society has forgotten all about among all the 'more, bigger, stronger, free, instantly' sentiments. I pay for a service...it shouldn't be blocked ever ....it it were I would say only in government buildings with proper notice that this was going to happen. it is my "free liberty" to buy a scrambler and use it wherever i want, as well.